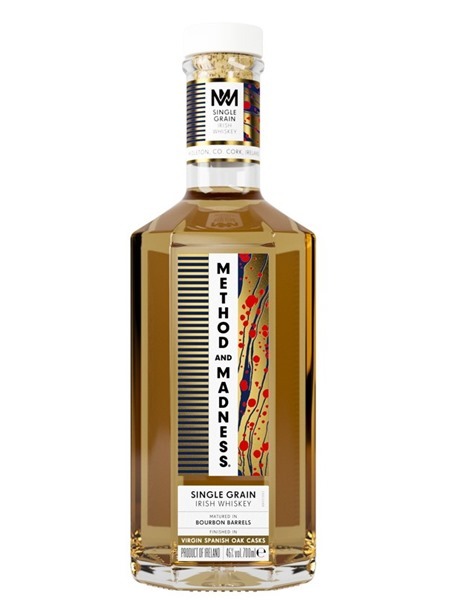 Method and Madness is the latest series release from Midleton distillery, which includes this single grain, a pot still, a single malt and a 31 year old single grain. The brand has been created to push the boundaries a little. The 'method' being the solid foundation we know in the form of Midleton whiskey and the 'madness' bringing something a little different. An Irish/Swedish couple (M&E Designers) created the art work for the series. This is the first ever general release single grain whiskey from Midleton - they previously facilitated an Irish Whiskey Society Single Grain bottling. This whiskey carries no age statement and has been matured in first fill ex-bourbon barrels. While we are all very familiar with the use of ex-sherry, Spanish Oak at Midleton, the little bit of 'madness' here comes in the form of a Virgin Spanish Oak finish to impart a gentle wood spice to go with the natural sweetness of the grain. Method and Madness Single Grain is non-chill filtered and bottled at 46% ABV.